Following yet another suffocating semifinal win from the defending champs from Duluth, UMass and Denver staged a game that filled the arena with wild goals, improbable comebacks, three ejections, and a gripping overtime climax. 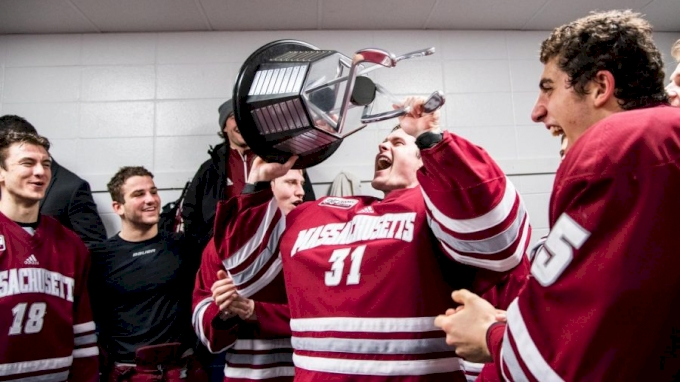 The sudden-death blow was struck by UMass freshman Marc Del Gaizo just past midnight, a blistering 30-foot slap shot, ending a hockey drama for the ages. Based on chants of “Let’s go, UMass!” reverberating through Buffalo’s Key Bank Center 15 minutes after completion, college hockey had just received its much-needed jolt. Fans knew the boilerplate script for college playoff hockey—perimeter grinding—had been scrapped at the get-go. The daily grind had been replaced by frenetic action, fueled by overzealous zebras. Six penalties, including two ejection majors, resulted in a total of four power-play goals amongst the 21 shots on goal, a tsunami of offense by recent tournament standards. When the ice chips settled after 20 minutes of play, UMass had won the special teams wars, and led 3-1. Over 13,000 hockey fans in Buffalo weren’t sure what they witnessed, but there wasn’t a single complaint. The game’s equilibrium was restored the next period, and UMass maintained its two-goal lead despite taking another major penalty. Coach Greg Carvel had now lost two rugged right wings and was forced to scramble. Everyone at the benches was sweating this night. “That was not comfortable losing those guys,” Carvel said. So the guy known as Carvy scrambled his lines, finding brand-new combinations on the fly. He almost pulled it off, until Denver made magic in small spaces—twice in the latter stages—to tie the game in the latter stages of regulation. The national coach of the year had to earn his money during the third intermission. It was an appropriate ending to a gripping contest, a ripper off the post, the seventh goal off the 68th shot. This was a night where oppressive coaching took a back seat to fun. Denver died a glorious death in sudden death from a kid’s mighty blow. Wagon-wheel hockey was back in vogue at the Frozen Four. It sets up a national championship showdown steeped in contrasts: offense versus defense; Hockey East versus the NCHC; the irrepressible force meets the immovable object. The champions take on the new kids on the block. College Hockey Saturday has become appointment viewing once again.